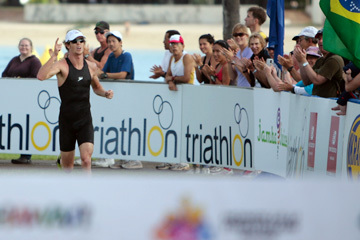 Mitch Dean of Australia raised a finger as he neared the tape during yesterday's Honolulu Triathlon. Mitch Dean took a stealthy approach to win the relocated Honolulu Triathlon yesterday morning, trailing the leaders for most of the race before stealing a victory with a time of 1 hour, 46 minutes, 55 seconds. "I think I was lucky because I'm a bit of an unknown quality, the guys weren't really watching me," the 27-year-old from Queensland, Aus., said with a grin. "I'm very lucky, actually." He stayed right behind runner-up Manny Huerta, of Miami, and third-place finisher Haven Barnes entering Ala Moana Beach Park. The trio had opened a wide gap from the rest of the pack during the 1.5-kilometer swim, 40-kilometer bike and 10-kilometer run up and down Ala Moana Blvd. But it was Dean who had a trump card to play about 200 meters from the Magic Island finish line. "(I was trailing) deliberately though, you know. Just pace off the other guys, and give it all you got in the last mile," Dean said. Huerta crossed 5 seconds later. Jasmine Oeinck, 20, of Littleton, Colo., was the top female finisher with a time of 1:56:51. She credited her opponents -- second- and third-place finishers Sarah Groff and Sara McLarty -- as her key to success. The three communicated together on the cycling portion of the race, the strongest event for each, and rotated the lead. When it was time to ditch the bikes and run to decide the winner, though, it became every person for herself. "Sarah Groff and (McCarty) were great to run with, we really pushed each other," Oeinck said. "With like a (kilometer to go) I just said, 'If I die, I die.' I probably didn't lead 'til the footpath coming in to the finish (on Magic Island). Sarah Groff and I were working really well on the run, just feeding off of each other. I was very fortunate to have her there." Both Dean and Oeinck take home $3,000 for their first-place finishes. It was the first time this route has been used for the triathlon. In the last two years it had stretched throughout East Honolulu, so Dean and Oeinck set initial course records even though the distances were the same. There is less hilly terrain, and more of an urban setting to the new race -- which had the potential to cause some traffic jams. But race director Bill Burke and HPD Major Randy Macadangdang were pleased with the execution of the race, especially considering it was an untested route. 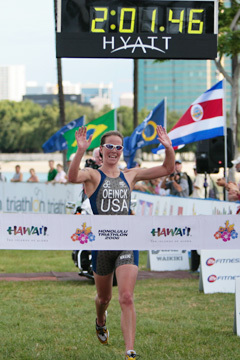 Jasmine Oeinck was the first female finisher in yesterday's Honolulu Triathlon. Burke said all participants were able to get into the water to start the race more than 2 1/2 hours ahead of schedule from last year, because of an expanded swimming loop that called for just one big lap instead of two smaller ones. Thus, waves of swimmers were able to get released at a faster rate and move on to the rest of the race. "Two and a half hours of road closures have now just gone away," Burke said. "It was very important to come here today and hit a home run, and not only with the athletes but with the business and residential communities. Especially on Mother's Day morning." "Everybody was on schedule," he said. "The planning was fantastic. Traffic was good -- so far we've had our fair share of people trying to get through other businesses to eat their brunches and breakfasts, but other than that it was OK."
The sunny weather and light breeze seemed to help relieve swimmers' concerns of the March sewage spill in the ocean. Burke said that overall race numbers were down about 230 from last year, but the number of participants were up for Japan and the U.S. mainland. "This is the first sporting swimming event since the spill, and we're proud to hold that distinction," Burke said. Local triathlete Matt Seymour of Diamond Head laughed off any worries of bacteria in the water. His lack of concern seemed to suit him well as he finished in fourth place overall and took home $1,500. "I swam in the Hudson, I swam in China, and the water quality there is 100 percent different than here," Seymour said. "Same thing in Europe. We swam in some rivers and lakes that are just ..." he winced and trailed off. "So I mean, coming here, yeah I heard there was a sewage spill, but I know we have a good water flow in and out of Hawaii, and the sun's hot every day; it burns off the bacteria." Each female finisher received a rose for Mother's Day just after crossing the finish line. Margaret Shapiro, 29, of Virginia, got some family support while she raced and finished in sixth place among women. "My brother brought a sign that said 'Yay, yay, Mother's Day' and was holding it up as I was running by," said Shapiro, a mother of two. "And the last 2K or something, I was just trying to think like, 'Have a good day, it's Mother's Day, have a good day! "I didn't think about my kids too much at the time, to be honest," she added.